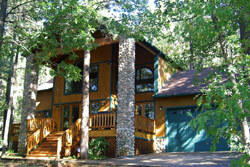 The Ponderosa Lodge is a stately custom home sited on a hill in the Pinetop Country Club area. This beautiful home is on over a one half acre home site surrounded by towering pine and oak trees. The Kool pine breezes and our accommodations will refresh your SPIRIT! Large windows and sky lights flood the rooms with light and capture views of tall pines. A fieldstone fireplace with a log mantel soars to the 30 foot knotty pine ceiling. The Master bedroom, bedroom 2, and loft all feature cozy knotty pine ceilings, doors and baseboards. A bear rug and elk mount adorn the walls….. You feel like you’re in Pinetop! The incredible 38 foot redwood deck is perfect for alfresco dining, entertaining, star gazing, or just enjoying the kool mountain breezes. If you enjoy gardening, your own private garden awaits you! Enjoy growing your favorite veggies. You will love the ambience of The Ponderosa Lodge and will want to return again and again! The Ponderosa lodge is about 15 minutes to lakes and streams. Sunrise Ski Resort is about 30 minutes away.